The DreamLine Unidoor is a frameless swing shower door designed in step with modern market trends. The elegant design and an incredible range of sizes are combined in the Unidoor for the look of custom glass at an unparalleled value. 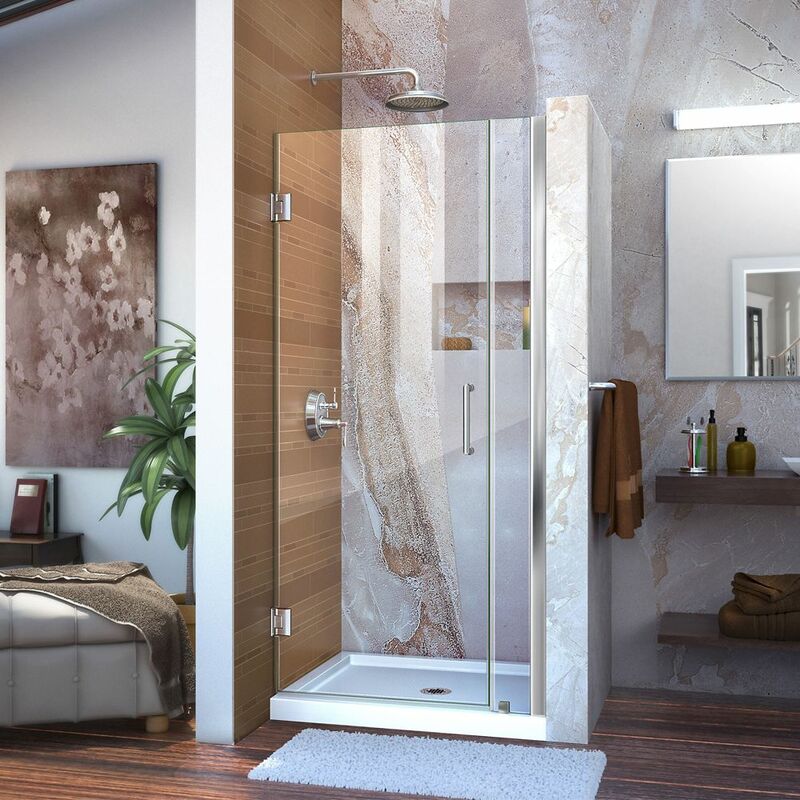 With clean lines, modern accents and an upscale look, the Unidoor collection adds timeless style to any bathroom space. Glass is treated with DreamLine exclusive ClearMax water repellent and stain resistant coating for superior protection and easy maintenance. Professional installation recommended. IMPORTANT All measurements should be taken only AFTER walls are finished tile, back walls, etc.. Solid brass wall-to-glass self-closing hinges. Wall studs or other reinforcement behind finished walls required for hinge installation. Optional SlimLine matching shower base available on select model sizes sold separately. Flooring threshold depth should be a minimum of 7/8 in. Unidoor 35-inch x 72-inch Semi-Frameless Pivot Shower Door in Chrome with Handle is rated 4.5 out of 5 by 21. Rated 5 out of 5 by Joann from Beautiful, well made doors and hardware.... Beautiful, well made doors and hardware. Rated 5 out of 5 by Beth from Beaitiful, high quality door. Looks far more expensive than... Beaitiful, high quality door. Looks far more expensive than it was. Requires 2pp to install. Rated 5 out of 5 by MamaBearD from I love this door. Our contractor installed it so I... I love this door. Our contractor installed it so I can’t speak to ease of installation, but the glass is thick and the spot-resistant coating works really well. It’s a gorgeous door that looks and feels more expensive than it was. It also arrived a few days earlier than expected. Would order again. Rated 5 out of 5 by Captrags80 from Beautiful door. About 4 hours to install. Use a PROFESSIONAL! Need 2 people for sure. Comes with ... Beautiful door. About 4 hours to install. Use a PROFESSIONAL! Need 2 people for sure. Comes with shims on bottom of door which makes it simple to hold/stabilize while mounting holes are marked. Really nice touch. Talked with customer service to make sure we were ordering the correct size door, could not have been more helpful. Highly recommend.